It was big news when the Anheuser-Busch InBev company bought Chicago’s Goose Island Beer Co. in 2011. But was it a great American success story, or an epic sellout? Those habits started changing with the rise of the craft beer movement. So the big players started buying up smaller makers – starting with Goose Island. “Now, Anheuser-Busch is poised to become the biggest manufacturer of craft beer in the United States,” Noel said. Chicago is unseasonably warm, but the leaves have turned and winter approaches. It’s barrel-aged beer season. Beer lovers have flocked to Chicago for one of the nation’s signature events: the Festival of Wood and Barrel Aged Beer. FOBAB, to those in the know. More than sixty breweries from twenty-one states are on hand. They pour 194 beers with colorful names and exotic backstories. Barrel- Aged Snarling Badger, a twice-fermented Berliner Weisse aged in French oak Syrah barrels from a brewery in Idaho. Barrel-Aged Frosted Frog Christmas Ale, a spiced ale from Ohio aged in bourbon barrels. Gnag Reflex, a tart and funky brown ale aged in new oak with cherries from Louisville. Every beer in the room has spent time in some sort of wood barrel. Bourbon, mostly. But also red wine, white wine, rye whiskey, rum, gin, and virgin oak. Most breweries are set up at folding tables at the edges of the brickwalled loft, pouring beer in precious two-ounce increments from plastic pitchers. One brewery stands apart, at an elaborate station just inside the entrance. Its tap handles have been drilled into actual barrels to seem as if the beer is flowing straight from the oak. (It is, of course, coming from kegs beyond the barrels.) That brewery is the only one in the room with enough sway, home-court advantage, and budget to construct such an elaborate show: Goose Island Beer Co. The twenty-four-year-old brewery is a Chicago icon and arguably the reason that so many people stand in the festive, beer-swilling space; back in 1995, Goose Island pioneered the industry’s first imperial stout aged in a bourbon barrel. The beer was named Bourbon County Stout. At FOBAB, bourbon barrel–aged stout has become an industry touchstone; it flows in all directions throughout the bright, airy loft. The room is feeling good. Craft beer is feeling good. It is still an underdog. But it is ascendant. Thirty-five years earlier, the nation was home to fewer than ninety breweries. Now, on this November day, there are nearly twenty-five hundred. More than four hundred have opened during the previous year alone—more than one a day. After decades of Big Beer’s bland dominance, American beer is rife with choice. Diversity. Flavor. And rarely is it more diverse and flavorful than at FOBAB. At the end of the night, thirty-two awards are given: a top-three in ten different categories, plus the top two overall beers poured that day. The brewery that wins more than any other? The hometown hero. Goose Island scores five medals, including the coveted Best of Show for its Cherry Rye Bourbon County Stout, an offshoot of the original forged seventeen years earlier. Its brewpub wins two more awards, which gives Goose Island nearly a quarter of the evening’s honors—seven of the thirty-two. Each time Goose Island’s name is called, its brewers hug and slap hands and leap to the stage. Their work is elite. Here is proof. Applause rises from the tightly packed crowd, punctured with a few hoots and hollers. But there is also a curious sound: a smattering of boos. They come from a handful of guys deep in the throng. They’re young and lanky and wear T-shirts, hoodies, and baseball caps. With their third or fourth jeer, I turn to one and ask: Why boo the hometown favorite? “I don’t like Anheuser-Busch,” he says. Many breweries tell the story of craft beer in the United States. Sierra Nevada. Boston Beer. Anchor. Bell’s. New Belgium. Dogfish Head. Stone. Lagunitas. Only one brewery is the story of craft beer: Goose Island. John Hall, a former box company executive, launched the brewery in 1988, when there were just two others in Chicago and fewer than two hundred nationally. Goose Island flourished through the 1990s. Then it struggled. It grew more. It struggled more. It innovated. It took risks. It grew still more. And then it sold out. Goose Island’s sale in 2011 to Anheuser-Busch wasn’t just a sale to the biggest beer company in the world—it was a sale to the company that had spent decades thwarting the American beer industry with confusion, trickery, and dullness. To Anheuser-Busch, less choice was less competition. It was more market share. When American beer was nothing but stadium sponsorships and Super Bowl commercials, Anheuser-Busch was able to account for nearly one of every two beers sold in the United States. Then came craft beer. American beer drinkers discovered variety. Tastes diversified. Anheuser-Busch could no longer simply suffocate competition. It needed craft beer. So it bought Goose Island. The announcement of Goose Island’s $38.8 million sale to the world’s largest beer company, on March 28, 2011, functionally ended an era for craft beer—an era of collaboration and cooperation, growth and good vibes, and the shared cause of building a lifeboat in a sea of Big Beer banality. Anheuser-Busch and its parent company, Belgian-Brazilian conglomerate Anheuser-Busch InBev, kept buying breweries, and as they did, divisions grew starker and more rancorous. The classic American success story—nurturing a business that changed an industry, then selling it for millions—became heresy in craft beer. 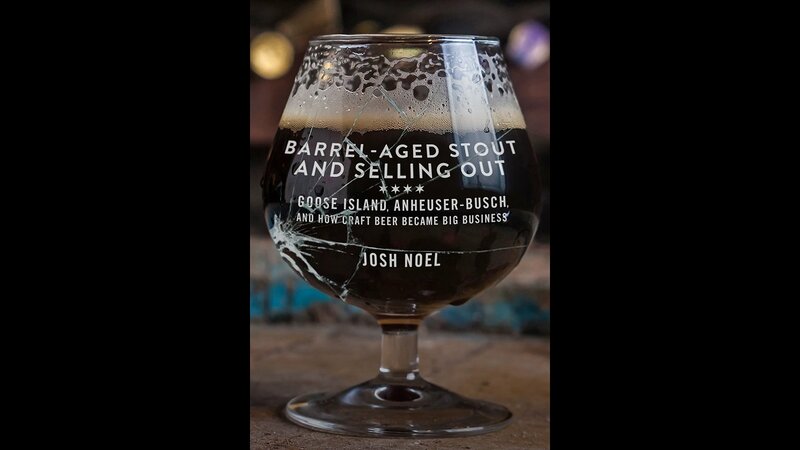 The beer industry entered an era of revolution—fragmentation, increased competition, and, for the breweries that dared to follow Goose Island’s lead with a sale to Anheuser-Busch, searing claims of “sellout.” Selling to the world’s largest beer company guaranteed growth for Goose Island and a payday for John Hall. His risk and vision were rewarded. But no matter how good the beer, how many honors or awards, how innovative Goose Island would ever be again, someone deep in the crowd would always boo.